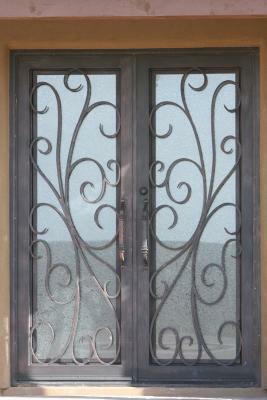 Customized iron doors are Signature Iron Doors specialty. We recently installed this door for a family near Scottsdale Arizona. They like our Milan style door, but wanted their scroll work to less tight. Our designers came up with a drawing for them immediately. Within a few months this family had their ideal door installed in their new home. Call us and come by our showroom in Phoenix Arizona to meet with a sales representative and discover how to obtain the ideal custom iron door for your home.